A few days ago i spent an evening to become an Oracle Technology Support Champion. 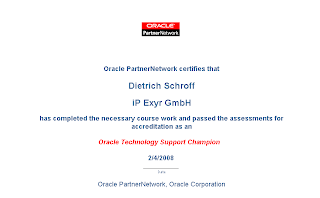 Why does Oracle offer such certificates? I think there are many people, who have no glue where to start for getting support and informations about the lifecycle of Oracle products. Oracle provides five years support for their main product from their general availability date (Database, Fusion Middleware, Oracle Applications). This is calles Premier support. For the details of the Premier Support follow this link.